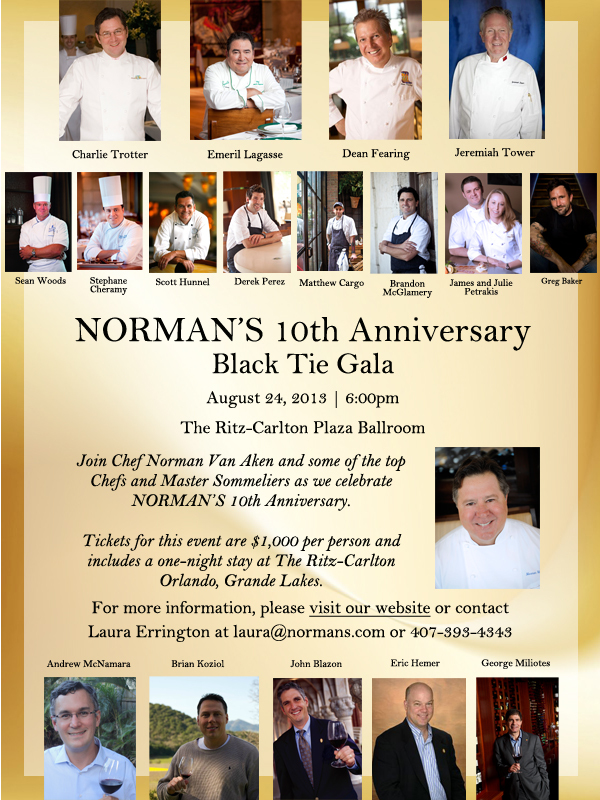 NORMAN’S CELBRATES 10th ANNIVERSARY WITH BLACK TIE GALA! James Beard “Who’s Who” Award-Winning Chef Norman Van Aken celebrates ten years of success in Orlando alongside his favorite celebrity chefs. Norman Van Aken is known as the founding father of New World Cuisine and introduced “Fusion” into the lexicon of modern cookery. He is the only Floridian inducted into The James Beard’s: ‘Who’s Who of Food and Beverage in America’. In 2006 he was honored as one of the ‘Founders of the New American Cuisine’, alongside Alice Waters, Paul Prudhomme, and Mark Miller in Madrid. He is the Director of Restaurants at the Miami Culinary Institute/Tuyo as well as the Co-Owner of NORMAN’S at the Ritz-Carlton, Grande Lakes Orlando and hosts a radio show “A Word on Food” on WLRN 91.3 FM in Miami. 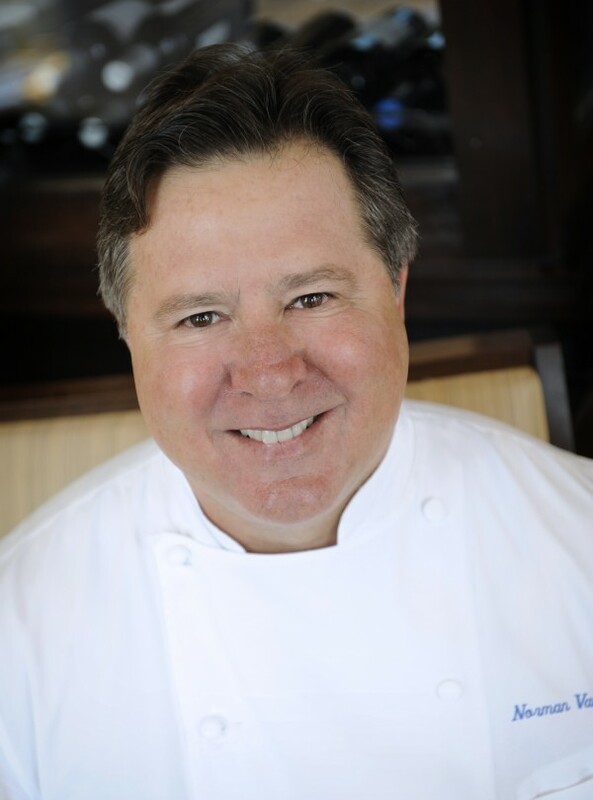 Orlando, FL – July 2013 – Chef Norman Van Aken is celebrating NORMAN’S 10th anniversary with a black tie gala on Saturday, August 24. The elegant evening will take place in The Ritz-Carlton Plaza Ballroom and will begin with a cocktail reception, followed by a multi-course dinner executed by celebrity chefs Charlie Trotter, Emeril Lagasse, Dean Fearing, Jeremiah Tower and several of Orlando’s finest chefs including The Ritz-Carlton Orlando’s Executive Chef Sean Woods and James Beard award nominated Chefs from Orlando including Victoria and Albert’s Chef Scott Hunnel, The Ravenous Pig’s Chefs James and Julie Petrakis, and Chef Brandon McGlamery of Luma on Park and Prato. 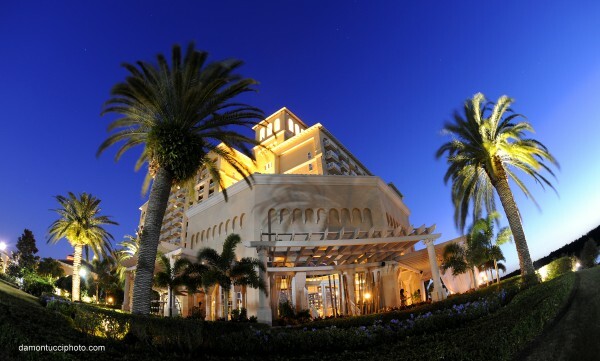 Chef Norman Van Aken has also invited six Master Sommeliers to elegantly pair wines with each course. The price for the black tie gala is $1,000 (inclusive of tax and gratuity) per person, and includes an evening at The Ritz-Carlton as well as autographed cookbooks by each of the Chef-Authors. Cocktail reception will begin at 6:00 pm followed by dinner at 7:00 pm. An after dinner soiree will be held at NORMAN’S with dancing, music, entertainment and libations. Norman’s will be donating proceeds from this event to Orlando Ballet, Central Florida’s only professional resident ballet company. Availability for dinner and rooms is limited and advance reservations are required. TastyChomps: Tell us more about this 10th anniversary, what are you excited about? Chef Van Aken: I am excited to have this amazing gathering of fellow lovers of gastronomy come together in celebration of our Tenth Anniversary at Norman’s at the Ritz-Carlton, Grande Lakes! Many ‘fine dining’ restaurants don’t get to celebrate that marker. This proves that the American public still care about the ideals chefs like my friends here and I spent our lives working toward. I am so excited to see the local chefs from Prato, Luma, The Ravenous Pig, etc listed for this event, how did they all get involved? The true restaurant world is one of neighborhood and collegiality. When I came up to Orlando ten years + ago with my son Justin, (who helped open Norman’s Orlando) I was aware how tough it was for the independents here to survive. The folks we have coming to cook with us at “TEN” have done more than that. They have excelled and we are delighted to share the time in our kitchens with them all. Many people have asked me about this, what are your thoughts about the $1000.00 price tag for the event? The event has much more expense than any we have ever undertaken. Yet our aspirations for providing our guests with life-long memories were foremost in our minds as we planned this celebration. To fly to any ONE of these great chefs restaurants would rack up more than that. But when you also consider the presence of 5 (!) 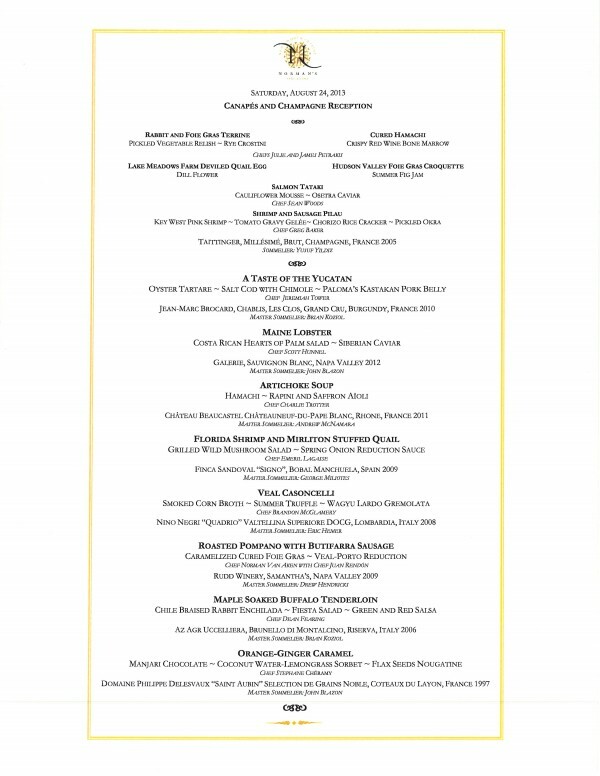 master sommeliers, the chef’s autographed cookbooks, the night at The Ritz-Carlton, the ‘After Party’…and now the “Meet and Greet” party on Friday (the night before the Gala) we are doing I think it is all going to be the event no serious ‘foodie’ wants to regret missing! As the father of “New World Cuisine”, what do you think Orlando has to offer in terms of food that many people don’t realize? 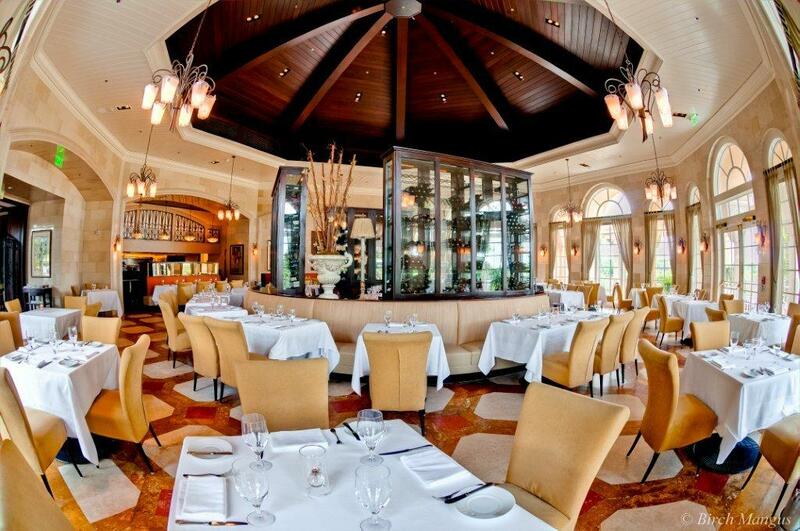 Orlando has a deepening restaurant community that is much more than one imagines! One have to get past the chains and into the ‘real’ Orlando. I did an ‘insider’s report’ for one of the national magazines on Orlando last year. I asked the owners of some of my favorite Orlando area restaurants where they like to hang out and I quickly had a nice roster. When anyone reading this goes to Prato, The Pig, Primo, 4 Rivers, Luma etc I suggest they ask the chef, bartender, manager where “they” recommend going for the best in local dining and they will be surprised! Heather McPherson and Scott Joseph were big helps on that list also by the way. What new things have you been working on lately? Any dishes you are particularly excited about? What are some of your favorite ingredients to use in the kitchen lately? I just returned from a visit to Costa Rica. 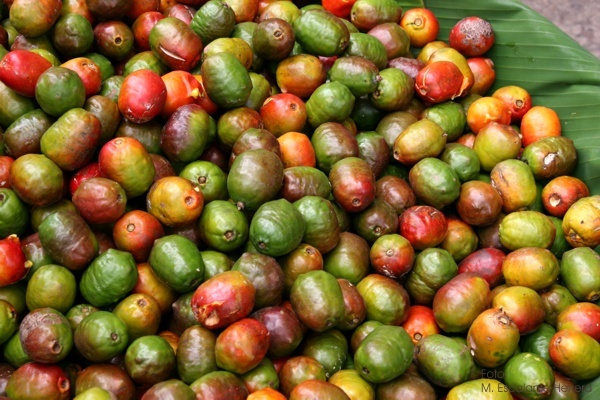 Jocote (a type of cashew fruit), Arracacha (a vegetable found only in the Andes – a mix between a carrot and a celery), and Mandarin Limes ( a hybrid between mandarin oranges and limes) were fun new finds! In addition to being Chef Norman, you have a radio program on local NPR affliate WLRN in Miami, a blog (http://normanskeywestkitchen.blogspot.com), and a recent book released with your son (My Key West Kitchen), so what is a typical day in your life like? My typical day is waking up just before sunrise and writing for my radio show or my next book(s). I like to write before the days ‘to dos and news’ fills my head! From there it is a light breakfast of yogurt and such before an hour in the gym. Then a very early lunch with my wife before heading to The Miami Culinary Institute where I spend the next 8 hours doing the many different things it takes to run our operations. Our team in Orlando, headed up by GM Yusuf Yildez, Chef Juan Rendón and Events Manager Laura Errington are often in touch over the course of the day. We plan for my next visit to Orlando and what co-owner Tom Wood and I want to do to perpetually move Norman’s Orlando forward. What are your thoughts on the recent food trends taking over America lately? Will you have a show soon on Food Network (I hear there are openings)? America has almost always been on two tracks when it comes to trends; the commercial and the artistic or artisinal. Increasingly I think people are seeing the relationship between health (or poor health!) tied to the overly commercial. A gaining portion of the population is leaning towards organic and locally grown. But the job is still very much still to be done. —- You never know! Next articleTaste of the Nation 2013 – August 10th – End Childhood Hunger!